We first visited Meganisi when I was seventeen. My parents, my younger brother and me. The plane ride into the military airport that was basically a generously sized shed with no air conditioning (it's been *slightly* modernised since then). Stepping off the plane into a wall of scented heat. The hair-raising taxi to the coast. Waiting in the burning sun at the harbour, and then the cooling breeze of the speedboat bouncing over the waves, past the private Onassis island, and arriving in Meganisi's tiny harbour, Vathi, to find picture-perfect white houses, bougainvillea tumbling everywhere, tavernas with blue-painted furniture lining the waterfront, and friendly Greek folk drinking tiny coffees, smoking, and arguing cheerfully with each other. Errikos restaurant on the harbour-front in Vathi. Meganisi is the quintessential Greek island of fantasy. Surrounded by crystal clear turquoise seas, you'll find tiny sleepy villages filled with flowers - roses, hydrangeas, geraniums, jasmine, basil and lavender - along with little family-run tavernas, shops filled with dusty produce, groups of men sitting in the shade clicking their worry beads, and black-clad ladies casually carrying baskets on their heads. As we were taking this photo, a lady from the house opposite rushed out brandishing a picture in a frame, which turned out to be a photo of her daughter on her wedding day, taken under the same floral archway. How lovely is that? The white-pebbled beaches (not sand - probably one of the main reasons why Meganisi has never become commercialised) are fringed with eucalyptus trees, with the green hillside rising steeply behind them, and the constant sound of the cicadas as the sun beats down. A few years later we came back again, this time arriving late at night to the magical lights in the harbour, and an exuberant welcome from the locals who immediately remembered us. We came back the next summer, and the next, and the next. We idled over dinner, grimacing over the truly horrible local wine that the taverna owners insisted on giving us for free, and said to each other "wouldn't it be lovely if we all still came back here as a family when we (my brother and I) are married with children". We were firm friends with the locals by this stage, and my brother and I spent our days on the beach, and our nights drinking with our Greek friends who worked in the tavernas and cafes during the day, and drank vast amounts of Mythos beer and ouzo by night. One legendary summer I drank the entire island dry of Cointreau, and they had to send over to the mainland to replenish the supply. I brought my new Portuguese boyfriend, and we came back the following year, and again after we got married, and again when our first brown-eyed daughter was nine months old. Visiting again after a gap of seven years, with my husband and all three daughters, was a bittersweet experience, encountering as I did on every corner the ghost of my younger self sunbathing on the beach, drinking ouzo by the pool, and zooming around in the scented darkness at 2am on the back of a Greek scooter heading recklessly towards an unknown location to party to last year's dance music. Everything is exactly the same as it was twenty years ago, and I'm exactly the same, and also completely different. Two versions of me pass each other on the hotel steps - my twenty-something self in a cheap turquoise TopShop bikini runs down to the poolside bar in search of ouzo, while my thirty-something self heads back up the steps in a coral Calvin Klein bikini, carrying my adorable sweaty two-year old who refuses to wear clothes in hot weather, while her two elder sisters scamper happily ahead. My younger self would never have predicted the life I have now, but I know it's exactly what she would have wanted. The pink one and the blue one are mine. Everywhere we went, we were greeted with cries of joy, and showered with free honey cake, and baklava, and chocolates, and wine. Meganisi is no longer the hillbilly rustic experience of twenty years ago, but although you can now get a glass of prosecco down by the harbour (unheard of!) there are still only two hotels, and the island has retained every ounce of charm. We're not the only people to go back year after year: "when did you first come to Meganisi?" is a common question among guests at the hotel, with the people (like us), who remember a (sweaty) time before the pool was built and the air-conditioning installed, being automatically assigned a certain status akin to that accorded to respected village elders. We stay at Hotel Meganisi - a charming family-run place that started off with about fifteen rooms and has now grown to more like forty, but still has exactly the same friendly vibe. The breakfast hasn't changed in twenty years - white bread with an impenetrable crust, hard boiled eggs, and little packets of jam (I like the peach marmalade). The coffee is horrible but if you ask in the kitchen they'll make you a proper espresso. At some stage they added warm breakfast items to the menu, little slices of omelette, or fried eggs, although we were rarely up in time to take advantage of them. The evening menu is also unchanged after all these years - moussaka, pastichio, green beans, butter beans, Greek salad, tuna salad, tomato salad, fried aubergines, tzatziki, chicken in the oven, spaghetti, and "all the usual things on the barbeque". Folk in the know recognise the mid-morning delivery of a certain type of fish as a sure sign that Christina's legendary fish soup will be on the menu that day, and present themselves promptly for lunch to partake (it will have sold out by dinner time). The Meganisi electricity pole - ruining my photos since 1997. The rooms at the hotel are basic but charming, with marble floors, green wooden furniture, and little balconies. The rooms in the newer block are larger, with terraces, nicer bathrooms, and a view of Ambelaki bay. We've stayed in both types, and generally prefer the older-style rooms with a view over the rooftops of Katomeri village, where you can be entertained by the to-and-fro of village life. We stayed in rooms 21 and 22 on the top floor this year, which were perfect. The view from the hotel pool. Greek people are so welcoming of strangers that they have coined a word to express it - philoxenia, the love of strangers. Children are adored and made welcome everywhere. The time difference plays nicely in favour of English families visiting with young children - 9pm English time is 11pm Greek time, which means if you don't mind your kids going to bed a bit late and having a siesta to catch up the next day, you can spend the evening as a family having dinner down by the harbour surrounded by skinny cats, wandering along to Café Boom-Boom (it's been called this for years) for strawberry granita, having a turn on the swings and roundabout in the little playground with the Greek kids, and then making your way home under the stars. We hired a dodgy car with a near-working hand brake, but the folk at the hotel are happy to drive their guests around in the hotel mini-bus, or the people in the tavernas will arrange for one of the waiters to drive you back up the hill to the hotel. 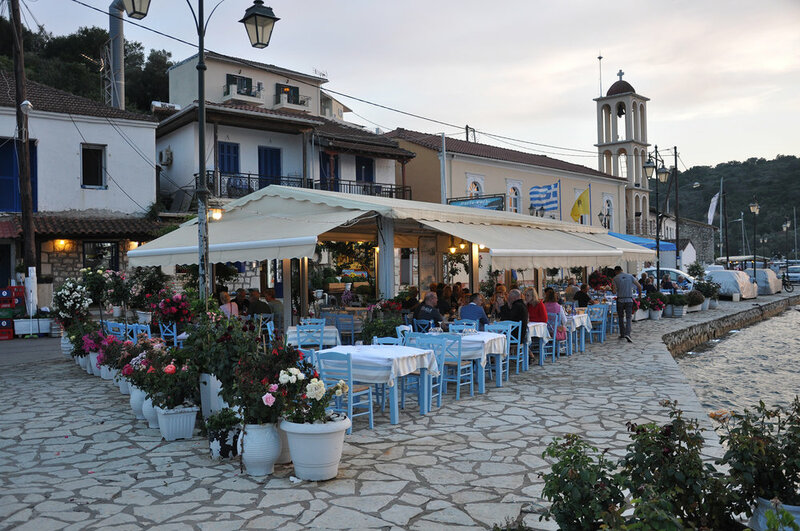 Our favourite restaurant, the Stavros taverna. When we first visited, the beaches had basic facilities - a shack selling bottles of cold water and beer if you were lucky. Now they all have parasols and loungers for hire (typically for 5 euros a pair), and our favourite beach, Fanari even boasts a reggae bar with fancy brightly coloured lounging sofas (naturally we prefer the more low-key traditional palm-leaf parasol-and-loungers on the other side of the beach). Agios Ioannis beach remains completely unorganised, as the Greeks say, with no facilities at all, unless you count the white sand under the water, dry silver seaweed on the beach, the incredible view of the mountains of Lefkada island, and the stunning turquoise sea. All three photos taken at Agios Ioannis. My parents were scheduled to fly in and join us partway through our holiday (they visit for a envy-inducing three weeks every year) but their flight was cancelled due to Greek air strikes so we ended up missing each other. Meganisi isn't easy (or cheap) to access. You fly to Preveza on either Sunday or Wednesday, take a taxi or hire car to the coast, drive across the causeway to Lefkada island, drive across Lefkada, and catch either the ferry or a private speedboat (if arriving after the ferry stops running) to Spilia in Meganisi. So it isn't somewhere like Corfu or Kefalonia, with flights arriving several times a day. Oh well, we'll all just have to come back next year instead. All three photos are taken at Fanari beach. Our girls loved Meganisi - playing with floats in the hotel pool, drinking copious amounts of fresh orange juice, watching their tablets in the shade of the large parasols, playing with their toys in their hotel room, swimming in the sea, having chips with every meal (it's perfectly possible to have Greek meals that don't involve chips, but from the perspective of our girls, why would you want to), buying sweets from the shop, and staying up late every night. I read about seven books during the week we were there, which tells you how relaxing it was, despite holidaying with a 7, 5 and 2 year old. Our toddler slept for hours on the beach every day in the afternoon - she lay down on a lounger watching Paw Patrol, and within five minutes was completely out. She then woke up buzzing with energy, and spent her evenings legging it up and down the road in Vathi harbour, shouting "I must do running", pursued by a dutiful parent or sister to make sure she didn't fall into the sea. At night they all went to sleep in the same room, and when we went to bed we brought the little one though into our room for the night, while one of us slept with the older girls. This way we could enjoy a peaceful drink on our balcony a couple of metres away without having to tiptoe around in the dark in case we woke the kids up. In short, Meganisi is a dream holiday spot for all ages. We can't wait to go back next year. Kali spera, Meganisi!